This entry was posted in cut flowers, daffodils, freeze damage, growing under lights, hellebores, late winter, snowdrops, spring bulbs, Uncategorized, winter flowers and tagged amaryllis, bulbs, snowdrops, winter flowers. Beautiful indoor blooms….I was lucky in that the weather never warmed enough for much to start growing…and we had lots of snow to help protect those that starting growing from the -20F temps of late….perhaps the hellebore will put on new growth again. I think the yellow of your new little auricula primrose is charming! Congratulations, “Papa”! Sorry to hear about the lack of snow combined with the Arctic winter blast, though. That’s always a really, really tough combination for plants to handle. I’m keeping my fingers crossed for you. thanks Cynthia, I think your crossed fingers helped because I haven’t yet seen much damage from the cold. 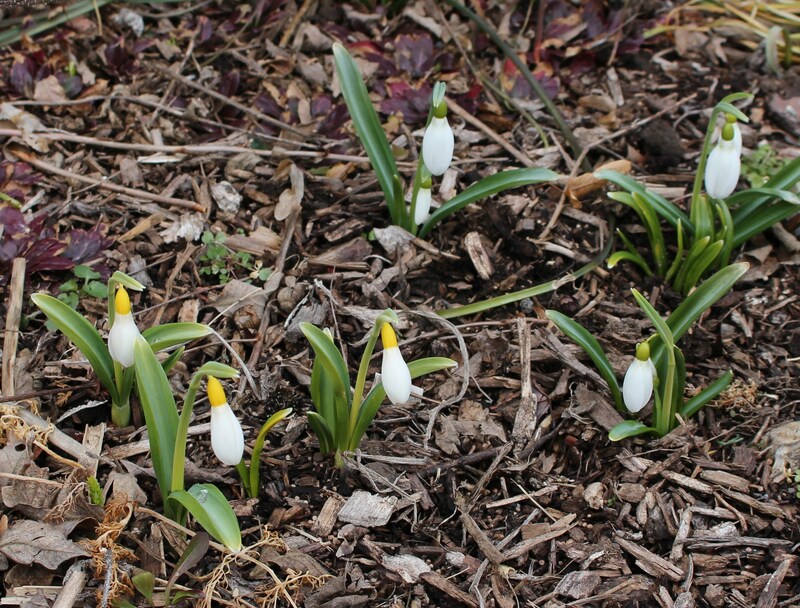 A few snowdrop blooms have withered but everything else seems unimpressed by the cold and wind. Today is a much nicer day though and the longer range forecast look promising. I think spring is gaining strength! Oh, that pale yellow eranthis has won my heart. Did you just luck out or is that a specific cultivar you hunted down? I am like Donna in that it never got warm enough to coax much into bloom. I hope you are pleasantly surprised by rebounding plants. And your primrose looks a better shade of yellow than “mustard” to me. You are doing quite well for -20. Very lovely. Thanks, but I still hope this will be winter’s last serious threat for the 2015/16 season. Oh dear! I don’t think I have experienced such intense cold. I always thought snowdrops and hellebores were indestructible; the worst they do here is hang their heads for a while. How disheartening for you, it is a good thing you have your garage treasures. Your auricula is lovely and I love your winter aconites. Lucky Mrs Bittster with such a magnificent bouquet of roses. That is really cold, Frank. I hope not too much has started sprouting and been damaged. I tidied up a few leaves and twigs off my rockery at the weekend and found quite a few perennials coming up already, although my bulbs are really slow this year. Your auricula is quite pretty, and that Amaryllis is gorgeous. I have never seen a dwarf one before – great idea as mine always tend to lean in one direction regardless where they stand! The pale aconite is lovely as well. Things have warmed up considerably this weekend and I was even looking at the front border and considering a cleanup. My neighbors will surely shake their heads, but the early bulbs will be much happier for it! Fortunately things weathered the cold quite well. The dwarf amaryllis is a little misleading. The first to bloom did so on nice short stalks, but the next one appears to be determined to flower at regular height… and lean all over of course 🙂 Maybe next year will be a different story, but I think the short part will only be something to enjoy this winter…. I guess it’s an ongoing study to see how every living species copes with climate change. I know, I know, it’s only weather, but I think we’re all starting to realize the two are related. Beautiful blooms, so cheery this time of year when we are all craving color. And yes that cold snap was nasty. So far it appears only plants from other parts of the world are having trouble with the ups and downs of the weather in my garden. I have faith it won’t be the thermometer that does the native plants in here…. unfortunately introduced insect pests, blights and fungus are a different story. Loss of habitat, habitat disruption… it goes on and on and none of it seems positive. Agreed. And the thermometer contributes to proliferation of many introduced pests. Too fast for evolution I’m afraid. Non edibles are not usually tolerated here either, its lovely when you can sneak them in and no one complains! I am sorry to read of your temperatures, that sounds ghastly for plants, humans and wildlife. 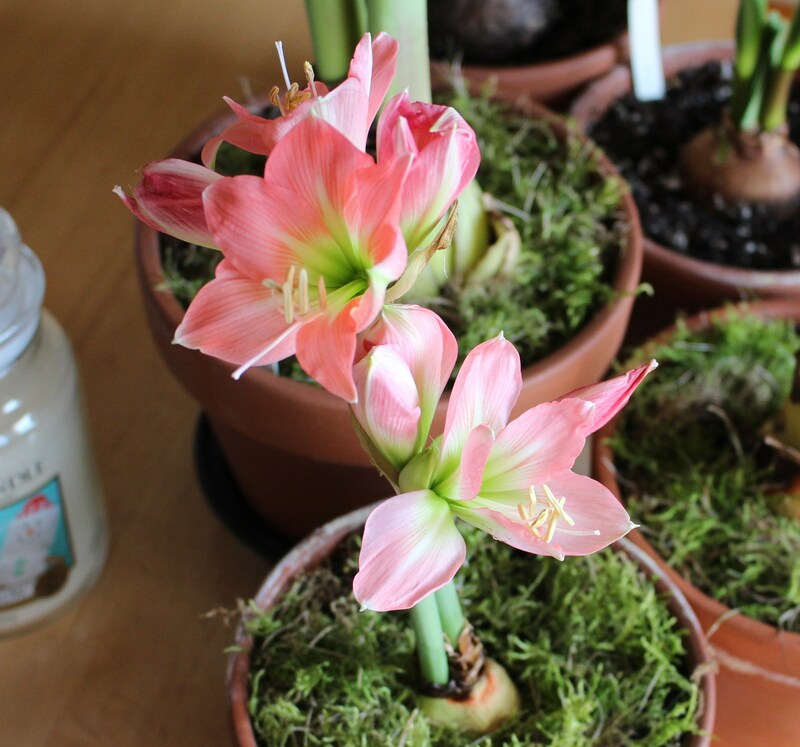 Your Amaryllis look lovely in the terracotta pots, I’d say it was definitely worth the search. I hope temperatures rise again for you soon. Thanks Julie. The temperatures have gone up in the past few days and it’s downright pleasant outside in the sun this morning. I’ll have to move my inside plants along and get them all blooming since once things begin to move outside the indoor plantings get neglected, and if the forecast is accurate things will begin to move shortly! Definitely worth the effort to source terra-cotta pots, and I’m impressed with the lovely green moss. Your temperatures sound devastating. Keep warm and positive. Every now and then I get a little irritated by the insect and weather damage, but fortunately there’s enough elsewhere to distract me and keep the outlook positive! The terra cotta pots always surprise me. They’re plain and downright cheap but they’re timeless, and I love the fact they’re made in Italy which you wouldn’t think, would you. That is cold. Keeping my fingers crossed for you Frank. Wherever we are the weather seems to be an increasing problem. My aconites have drowned. Good luck on your aconites, hopefully next year they will stand a chance and hopefully next year you won’t have the same relentless rain and gloom….. or snails and slugs which follow. You just can’t catch a break with the weather this year. First the never-ending autumn and now this arctic blast. Yuk! Sorry that so many of your lovlies got nipped by the cold. 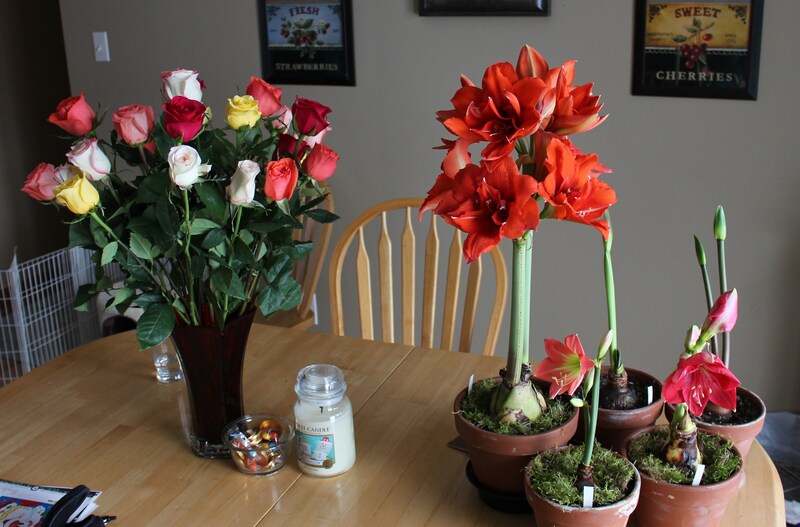 Your amaryllis are looking great! All I can say about this winter is. “Ugh!” Daffodils coming up just after Christmas, the ground not freezing until February, no snow to speak of! Just ugh! I did clip all the branches off the Christmas tree and covered up the newest and most delicate perennials, and then when we had our “blizzard” (2 inches here! ), I actually carried shovels full of snow over to some of the gardens to give them some extra protection. Hopefully that is helping them endure the swing from -14 on Saturday to +50 on Tuesday! It has been a weird one hasn’t it? For a while I wasn’t sure if it would ever actually get cold enough to freeze the ground… but then it did, and now I’m wondering if it’s going to be an annoyingly long and drawn out death as winter hangs on forever…. or not. Maybe we will get lucky! I’m glad to hear I wasn’t the only one out there shoveling snow onto flower beds! We didn’t have much either so I had to resort to little ‘snowcones’ on each plant I wanted to protect. Also, your Amaryllises look great! I have one new one this year who is about to open–Brazza is its name, and seven or eight from previous years are on their way. As far as roses, I’ve personally always preferred either a bunch of pale pink in a cloud of baby’s breath, or a mixed bouquet, such as your daughter helped choose. Good job! I should also say how nice your Winter Garden is looking, with the cyclamen and the primrose. Yellow is hard to photograph, but it came out well for you. Jealous of your winter aconite. I’ve tried it several times in different places in my yard, and it has never bloomed. And of course, the snow drops are lovely! I’m sure you’re tickled pink to see them! Funny you should mention the problems with photographing yellow, I was just searching the topic this morning trying to find any helpful hints before daffodil season comes along! Yes, I think they would do well there. They’d bloom before the ferns take over, and the ferns would then keep them shaded and protected from the hot afternoon sun later in the summer! I do have one of your yellow primroses planted up in the lasagna bed; hopefully it has survived the vagaries of this winter’s weather! I forgot about that primrose! I’m sure it will do very well this spring. I wish there was a damp spot in my yard, even the wetter areas dry out completely during the summer and are entirely primrose-unfriendly. I didn’t even know there were miniature amaryllis! Very cute! Your snowdrops are lovely. I hope they make it through the cold snap! 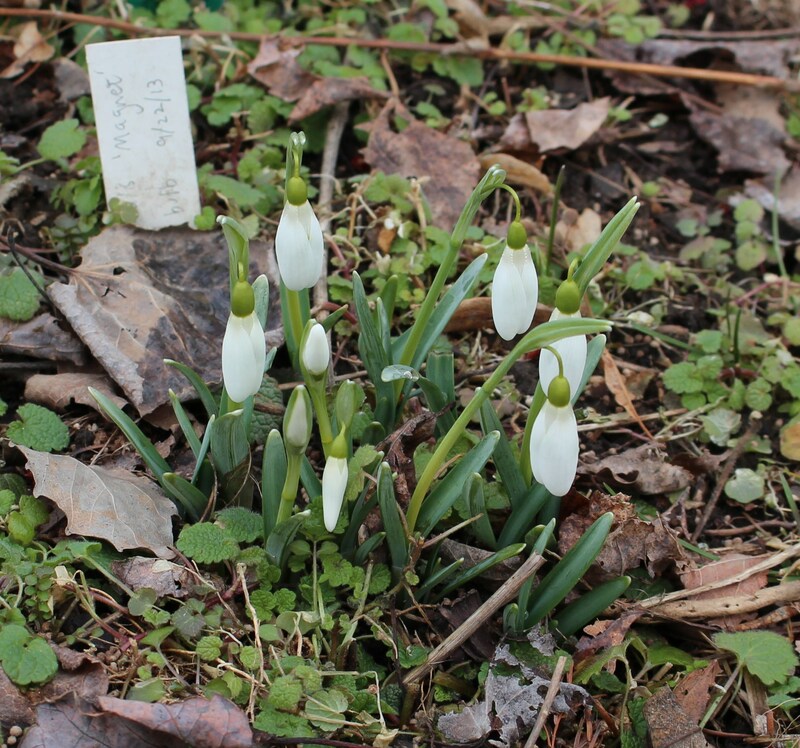 I have some snowdrops planted in the yard, but haven’t seen any trace of them this year during our warm spell. I hope I didn’t bury them too deeply in mulch this year! Your snowdrops should be just fine, even if you did go extra heavy on the mulch so I hope they are still yet to come. I have a few which haven’t yet appeared even with the early ones in full bloom. They’re a much more diverse group than you would think. Judging by my latest mini amaryllis, they might have small blooms but the stalk is going just as tall as the regular ones. 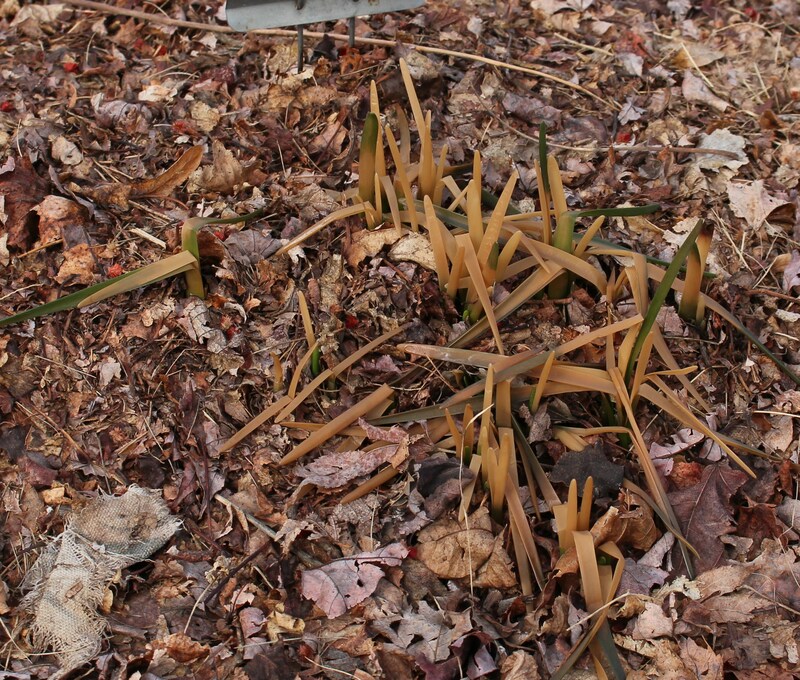 If I get them to bloom again next year I might be looking at a forest of stalks…. which wouldn’t be all bad, but the shorter ones sure are a lot less trouble! 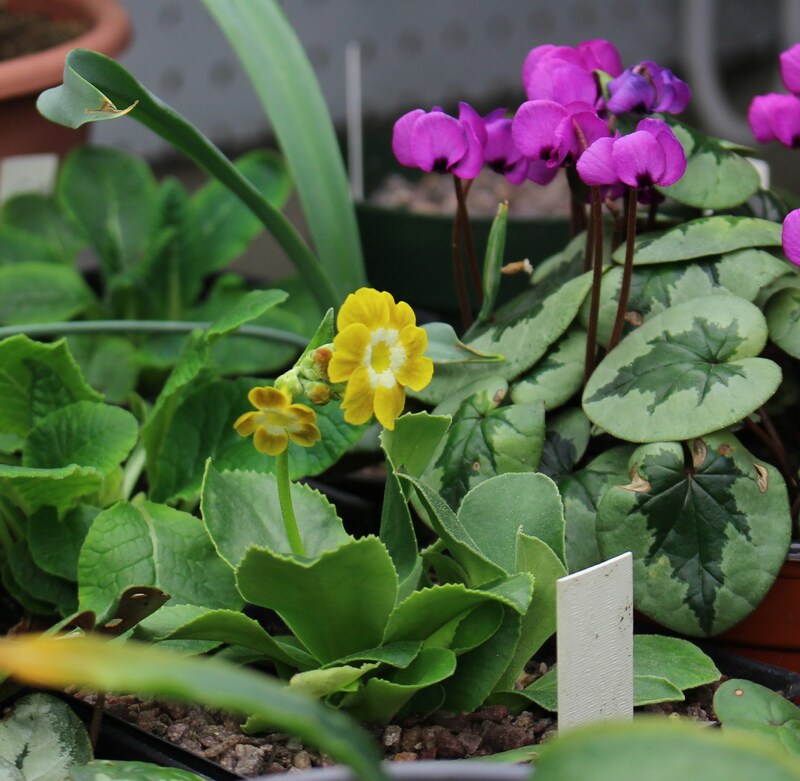 Love your auricula and the snowdrops, and am envious (as always) of the blooming eranthis. No sign of mine yet, but it’s only been 24 hours since the departure of the “snow blanket” so maybe there’s hope! Any signs of aconites? The warm weather here today brought things along quite a bit and made it feel downright springy. The only downside is things which looked fine this morning are now showing freeze damage as they thaw out completely. Win some lose some I guess. I do like seeing the primrose reminder of what will come outside (eventually!). You are getting a very nice collection of snowdrops. I’m sure they will weather the cold nights. 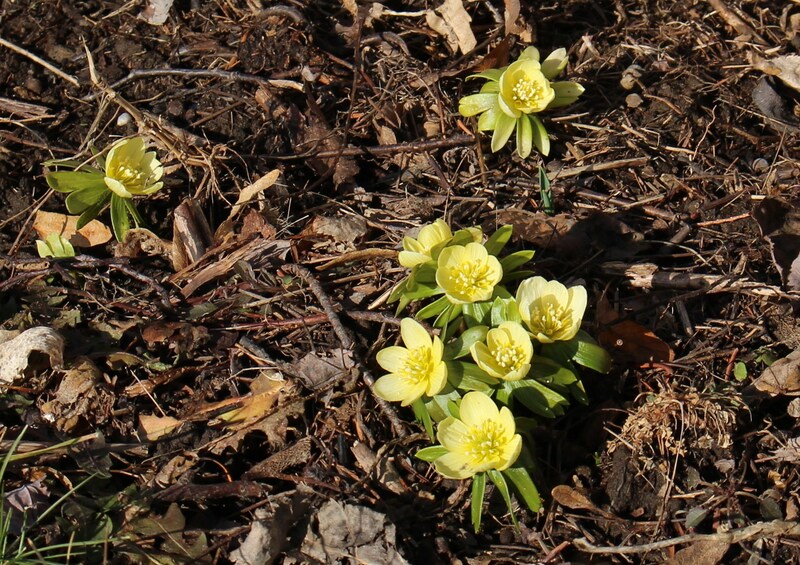 Do you know which pale Eranthis you have. I’m starting a few new ones from seed this year. I’m enjoying the primrose this year, it amazes me that the weak little seedlings I grew last summer managed to put any blooms out at all considering their neglect! The pale eranthis are from a friend and originally collected from an old estate. I believe the cultivar ‘Lightning’ was found in the same location. I’d offer seeds but looking at their condition this afternoon I believe they received much more cold damage than I first thought…. Oh, no! 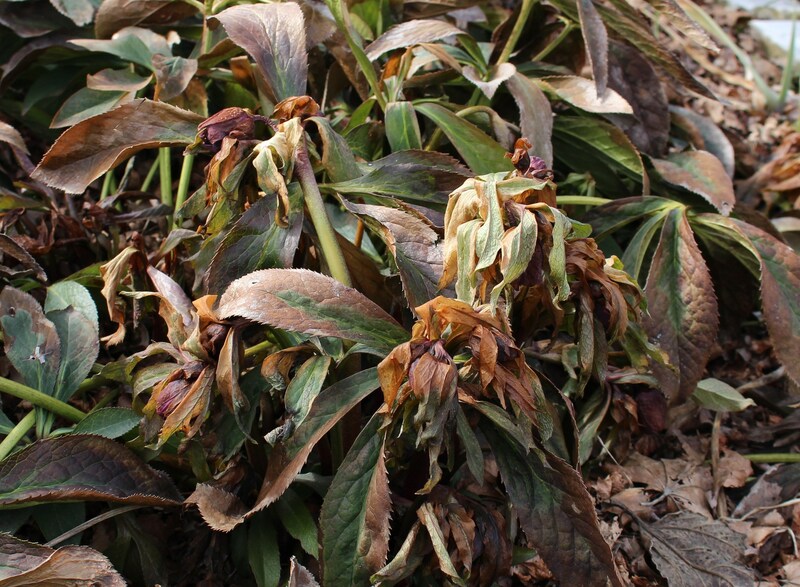 My Hellebores look like that, maybe worse. Don’t tell me they won’t bloom this year! hmmm. I hope they do bloom, but mine actually had growing flower buds damaged, not just the leaves. I’m still hoping a few new ones come along when things officially warm up. I don’t think ours had formed flower buds yet when they got blasted. A sever cold snap did in my snowdrops too. I never replaced them since they are tiny and bloom when I am not in the garden ever. Like you, I am not about to cover up any plant at this time of year. Annuals in spring might get row cover with late frost, but mostly I take the chance on them too. That is one advantage of city living. Almost always a zone warmer in my garden.